Cast: Forest Whitaker, Oprah Winfrey, Lenny Kravitz, Robin Williams, James Marsden, John Cusack, Alan Rickman, Mariah Carey, Cuba Gooding Jr.
Synopsis: A look at the life of Cecil Gaines who served eight presidents as the White House’s head butler from 1952 to 1986, and had a unique front-row seat as political and racial history was made. Verdict: Another year, another film about the African Americans’ struggle for racial equality. This one’s centered around a character who’s grown up to only acknowledge the White Americans as masters and to serve them with his elder son fighting for the rights for the black. 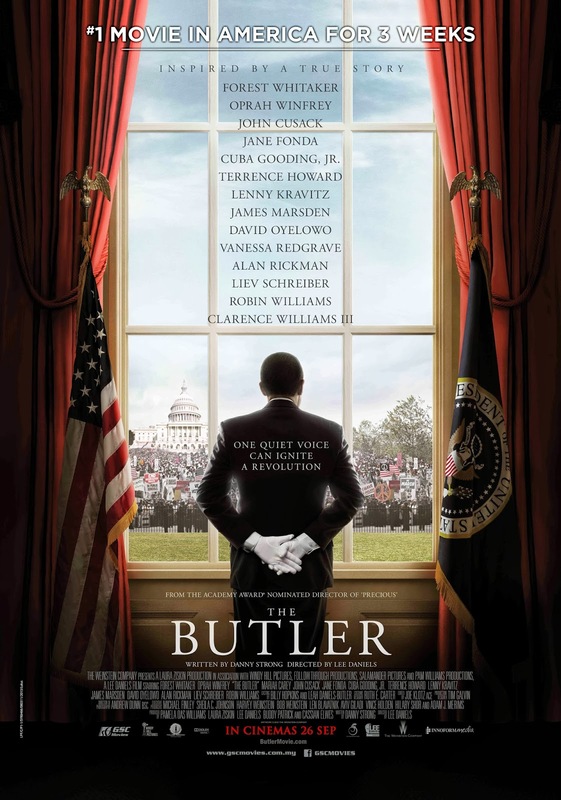 The Butler is no Forrest Gump but it’s still pretty interesting and educational as the story starts from 1920s till 2008, depicting the historical figures, politics and activities in the White House and of the African American Civil Rights Movement. While the “white guilt’ approach of the genre is extremely tiring, the film manages to convincingly convey the need for courageous, stubborn activists to fight for what’s right and turning the non-believers to supporters (*cough* Bersih 2.0 *cough*). It is inspiring more than emotional. Forest Whitaker’s performance is almost Oscar-worthy, Oprah Winfrey does a decent job as well but the biggest question mark is John Cusack as the infamous Richard Nixon who’s nothing like the 37th President of the US at all. Another issue which most historical critics have with Lee Daniels’ The Butler is its historical inaccuracies which I, as Malaysian, wouldn’t be able to relate to anyway. Is it based on a real life butler? Although the titular protagonist is fictional, the film is inspired by Wil Haygood’s 2008 Washington Post article A Butler Well Served by This Election which chronicled the real life of former White House butler Eugene Allen. Malaysian censorship: Literally nothing to cut at all. Movie stills / images: View ’em here. Inaccurate portrayal of Ronald Reagan? Most historical critics have blasted at The Butler for its portrayal of Ronald Reagan (Alan Rickman) as a president who fakes his kindness towards coloured people to gain popularity. It is not explained in the film as to why he does not support the Congressional sanctions against South African apartheid, making the 40th President of the United States seem like a total no good racist fellow.